This security poster illustrates the VZD-6Ch & VZD-3M Timers Russia Initiator. These timers are a clockwork 6 hour timer mechanism. They are supplied in a Bakelite box with the mechanical VZD-3M fuze, usually used with limpet mines, but also for use as a booby trap timer. This security poster features the VZD-6Ch & VZD-3M Timers’ specifications, an exploded diagram of the VZD-3M fuze, the time delay chart for the VZD-3M fuze, and a sectioned VZD-6Ch. 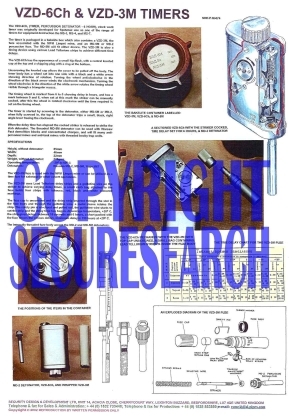 This security poster also shows photographs of the Bakelite container labelled VZD-3M, VZD-6Ch, and MD-5M, MD-2 detonator, VZD-6Ch, and wrapped VZD-3M, as well as the VZD-6Ch mechanism with the VZD-3M with top cap unscrewed. A sectioned VZD-6Ch with the striker cocked, time delay set for six hours, and MD-2 detonator. Photograph of the Bakelite container labelled VZD-3M, VZD-6Ch, and MD-5M. Photograph of the VZD-6Ch mechanism with the VZD-3M with top cap unscrewed. The time delay chart for the VZD-3M fuze. Photograph of MD-2 detonator, VZD-6Ch, and wrapped VZD-3M. An exploded diagram of the VZD-3M fuze. The VZD-6Ch & VZD-3M Timers’ specifications. This security poster features the timers' specifications, an exploded diagram of the VZD-3M, the time delay chart for the VZD-3M, a sectioned VZD-6Ch, photographs of the Bakelite container, MD-2 detonator, VZD-6Ch, wrapped VZD-3M, and the VZD-6Ch mechanism with the VZD-3M.